Day 2 of the 73rd NACAC National Conference in Boston was filled with informative sessions, networking, the Counselors’ College Fair, and fun in the Exhibit Hall. The sun has set on the first day of the 73rd Annual NACAC National Conference and social media was abuzz with tales from the day. Here’s a quick snapshot of what went down in Boston on Thursday, Sept. 14, Day 1 of the conference. I just completed my 19th year as director of college counseling at Kents Hill School in Maine, 15 years of which also included building and directing its international program. As I close this chapter and begin my next as director of academic advising and college counseling at The American School in London, I am awed at the rapidly changing landscape of international students in the US, particularly at our high schools, and the dire need for more professional development on both the secondary school and college side in support of this growing population of students. The deadline for proposals to present at NACAC’s 2017 National Conference has been extended to Jan 17. 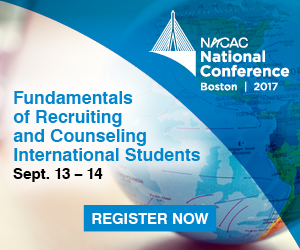 Submit a proposal to present at NACAC’s 2017 National Conference, scheduled Sept. 14-16 in Boston.